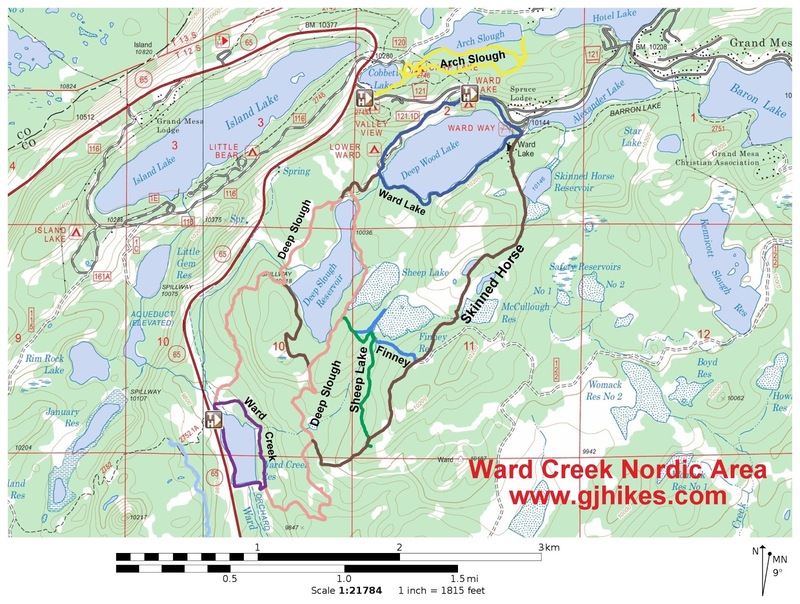 There is a groomed trail that runs from Ward Creek Reservoir all the way up to Ward Lake. 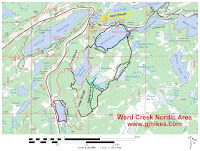 The groomed trail wraps around the east side of Ward Creek Reservoir providing easy traveling for more than half of this outing. The trail grooming is supported by the generous donations of those using the trails. There is a donation box at the trailhead or you can also make a donation on the website of the Grand Mesa Nordic Council. The groomed trail heads north from the trailhead for a short distance and crosses a bridge that spans Ward Creek. The shallow creek flowing in and out of the reservoir was ice free in places. The trail passes through enough trees on the east side of the reservoir to provide a feeling of solitude. While the highway is only a short distance away there is still a feeling of being out in the woods and away from the hustle and bustle of everyday life. The peaceful winter scenes soothe the soul while the crisp winter air invigorates the body. And it's always nice to have someone to share the experience with. At the south end of the reservoir the groomed trail breaks away and begins its climb up to Ward Lake. It is at this point that you can leave the groomed trail and make your way across the dam back towards the trailhead. You can avoid having to walk through the creek if you go about 50 feet past the dam and then cut back along its berm. The shoulder of the highway is one way to get back to the trailhead. Instead we chose to walk along the shore on the snow covered ice. You will have to use your own judgement as to how safe it is to travel on the ice but it proved to be completely solid on our trip. Ward Creek Reservoir, with its easy access next to the highway, is a fun place to go to tromp around in the snow for awhile. If you are looking for something easy to do at a slightly lower elevation than most of the Nordic trails then you might want to check it out. If you would like to see it for yourself then all you have to do is 'Take a hike'.